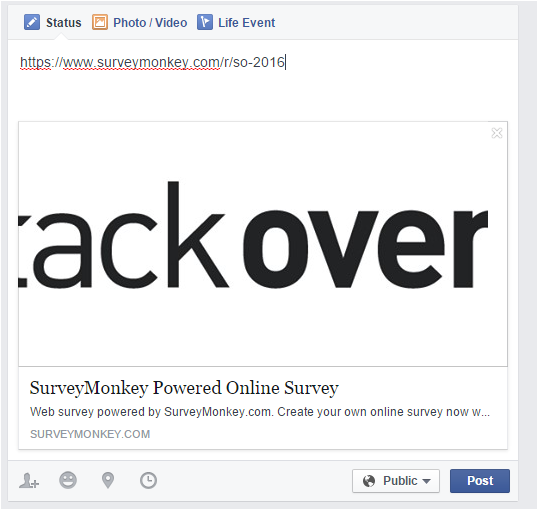 Update: This survey is now closed. Stay tuned for release of the full results. It should take about 10 minutes to complete. We know you have bugs to squash and things to build and taking surveys isn't in your job description, so we appreciate your attention. Just like last year, we'll be compiling the results over the next month, and will present them to you so you can see for yourself who works remote, who likes working at night, and who considers themselves a rockstar, ninja, guru, etc. Do you? Let us know. I've said it once and I'll say it again: stop asking questions that assume that I have a career/job. What annoys you most when searching for a new job? I have never held nor searched for a job. I love the technologies I use at work. You gave "Student" etc. as an option for the "occupation" question, yet you assume I program professionally here! All of the "how do you classify yourself" options assume that if you're not some sort of programmer that you must be management. There are no options at all for designers (many of us who participate in the HTML/CSS tags would classify as one), testers, or UX specialists. What confused me is out of the top 10 up voted answers from Suggest a question for the 2016 Stack Overflow Developer Survey. Only 2 answers was chosen for the actual survey. Now I understand that we were just suggesting some questions, but I think if you included more of the answers from that question, the survey and results would have been a lot more interesting for the community (Since we are interested in seeing the results). It's very hard for me to decide whether I "love my job" or "somewhat satisfied." There is a lot in between. I do enjoy my job a lot, but "love" is something that doesn't go with work. 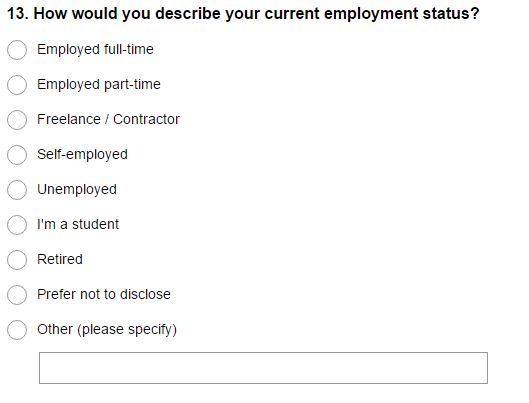 Also, I'm a full-time employee, student and an entrepreneur but I can only select one in that question. You don't want to know about people having more than one hat? I couldn't click fast enough on "writing cover letters" as the most annoying thing about finding work. In fact, thinking about it now, I'm still annoyed at the thought of writing a cover letter. Those were some curiously large pennies. Looking forward to the responses, and hopefully this year - a t-shirt as well. How would you best describe the industry you currently work in? A bit sad to see that Agriculture is woefully missing. Everybody eats, and you might not realize just how much technology is used in food production. It will be interesting to see how this compares to last year, where over half the responses fell into unlisted or potentially ambiguous categories - 20% other, 25% software products, 17% web services/Internet. Specificity will be interesting, especially since this survey is still missing a few cornerstone economic sectors. "I just like taking surveys" was rather cute. Although I am a Stack Overflow user, it's fun to see stuff like that sprinkled in. Just a nitpick: as a user of Atom and Vim as my two primary general-purpose text editors, calling Atom “atom.io” felt a little weird. So much so, that it took me a few moments to find it! I think that might have made a little more sense two years ago, when it was new, but the editor is called “Atom”. But y’know, just my two cents. I don’t actually use Stack Overflow. I just take surveys. 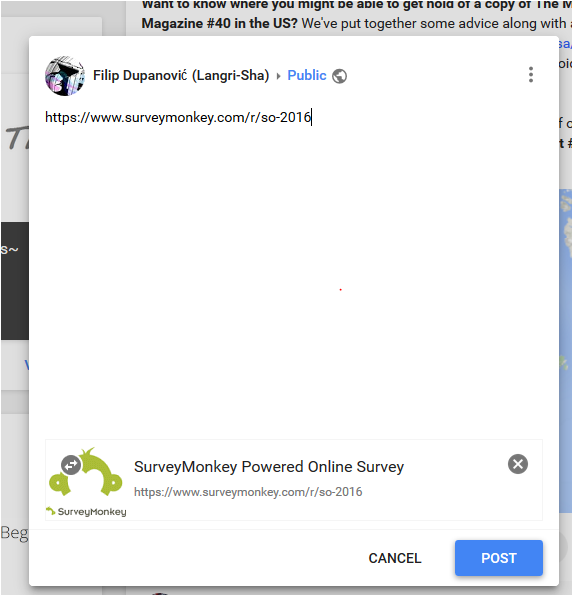 I don't know whether it could be achieved this year, but please could you pay attention to how social media sites scrape the survey page? The document metadata is completely misrepresenting the survey and looks wholly uninteresting. How am I to grab the attention of my peer developers? you actually don't have any option for a class targeted at kids/teens/them youngins. I did a course when I was 10 that was my first time learning programming. It is the only somewhat official training I've received but none of the categories seemed to match. It seems like this will only become more common with initiatives like Coder Dojo, so I think it makes sense to have as an option. I missed the option on many question to select more than one answer. For example "What sector your company is in?" My company is in the financial government sector - ouch? What to choose? Finanical? Government? Other? It would be great to give some badge/bonus reputation for those who participated at survey. So, let's say you live in the UK and earn money in pounds £. Since you've selected UK on page 1 going into page 2 should ask you for salary range in £ rather than US $s? It would save you the hussle of going to google to convert your salary from £ to US $. What do you think? I know what Full-stack developer means, but never heard of Full Stack Overflow developer. Does it mean something like those developers have their stack overflowing or something? You forgot to put QtCreator in the IDE selection. In my case I am both a student and employed full-time. It's entirely likely that many people would have some sort of combination between any number of the options provided, and it's not very clear which one should be selected over the other as it currently stands. I suggest changing the options to be checkboxes, or having a combination between checkboxes and radio buttons. Maybe next year you can ask about ReSharper as I am quite wondering about statistics on that. Whenever I'm asked to provide an estimate, I always double it and add a bit. Probably won't be a T-shirt coming my way. Can I get a list of my answers somehow? I'd like to look back at these questions in a few months and see if my attitude has changed. How many years of IT / programming experience do you have? It's hard to know whether to answer this counting non-professional experience (like, learning to code at home on my family's computer, or any unpaid development work). I'm going to go with including non-professional experience. But both are valuable things to measure, IMO, and are on the footsteps of important questions about how developers get good at development/self-taught vs/in conjunction with formal training, etc. I feel like "QA" implies that I'm a manual tester. I do QA automation, using Selenium; I'm a developer, but in QA. It'd be nice if there were a job option for this. 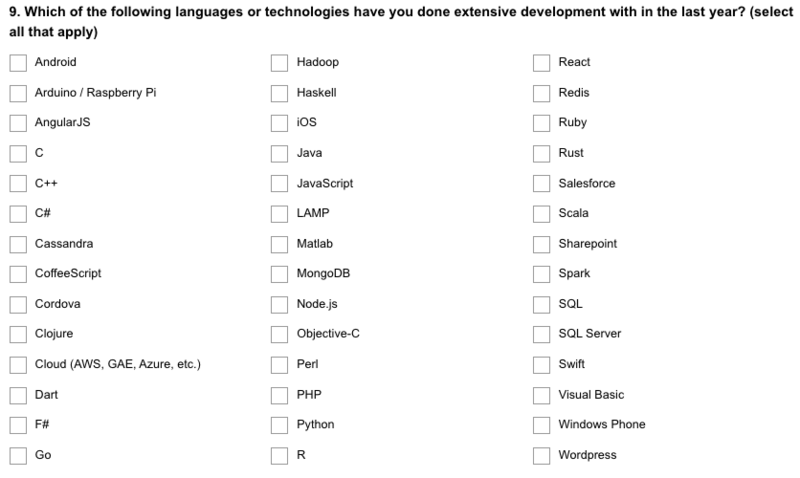 Which of the following languages or technologies have you done extensive development with in the last year? There is Redis, but what about Memcached? They both in-memory key/value pair cache servers. Since there are plenty of NoSQL databases, I think this should be combined into single: NoSQL option. Salesforce? What about Microsoft Dynamics CRM and other CRMs‎? Some CRM‎ Analytics/Specialists can be disrespected. SQL/SQL Server - what's the difference? You mean SQL client and server? It's the same thing/technology. SQL Server sounds for me like sysadmin/DevOps section and instead, I think we should have: SQL and NoSQL. Sharepoint? This is very small part of Microsoft Office server suite. Cloud (AWS, GAE, Azure, etc. ), what about OpenStack, Mesos, etc. LAMP? What about WAMP/UAMP/SAMP/FAMP? E.g. I'm actually using MMP (Mac+MariaDB+PHP, no Apache), so this should be more generic, like: Web Development, or stick with the languages. C, C++ - this is the same family of the languages, so it doesn't make sense separate them, but to make one checkbox C-family or C, C++ - so that checkbox space can be used for other trending district programming languages (similar to Arduino/Raspberry Pi checkbox, they're different, but it's the same family). Further clarification: I'm aware of the differences, however C and C++ are closely related and C++ grew out of C and it was designed to be compatible with C (See: Compatibility of C and C++), otherwise they wouldn't call it C-like. When you write apps for OS X, XCode accepts both C and Objective-C. So basically it's the same family of languages. E.g. when you develop apps for both Android and iOS, you write in C, not Objective-C, but basically you're writing the same app (for sure you won't use other language such as Java or PHP). The same we can say that Python 2 and 3 are languages with different syntax as you can't run P2 syntax on P3 and opposite. Or you can't run PHP7 in PHP4 and opposite, but you would expect one checkbox for for it. Secondly, this is just a checkbox to have more space for other interesting distinct languages in place. So for me it's not a big deal. Enterprise search servers: Apache Solr/Lucene, Elasticsearch, CloudSearch, etc. Infrastructure monitoring: Nagios, Opsview, New Relic, Cacti, Smokeping, Zabbix, Icinga, etc. CDN: Fastly, Amazon CloudFront, CloudFlare, etc. The survey is too long... Why couldn't you break it up into some differenet sections, different surveys instead of having this thing that takes a whole lunch break to fill out. 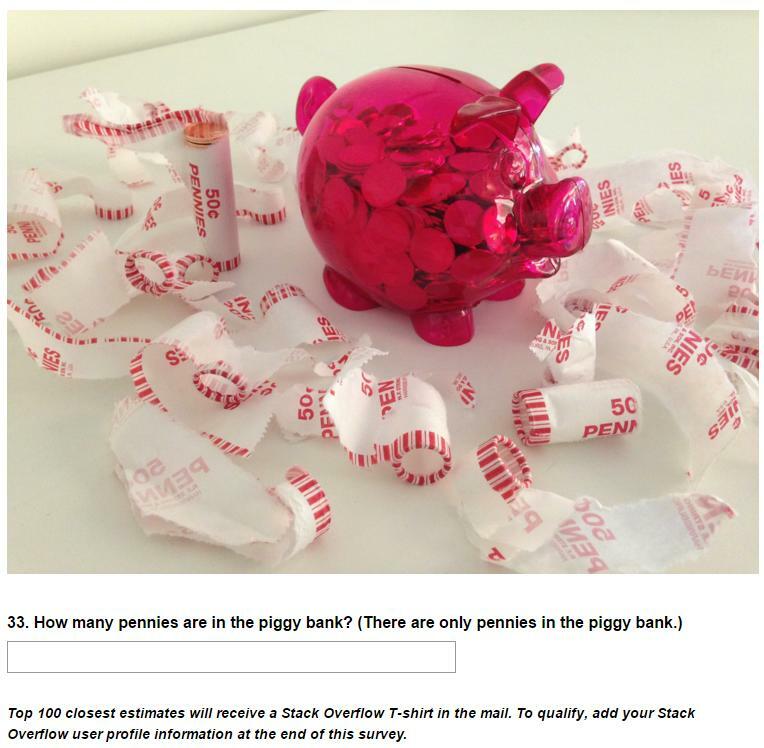 Developer survey: how many pennies were there? Do you think my comment was offensive?